In this lesson,we will look at integers and the number line. 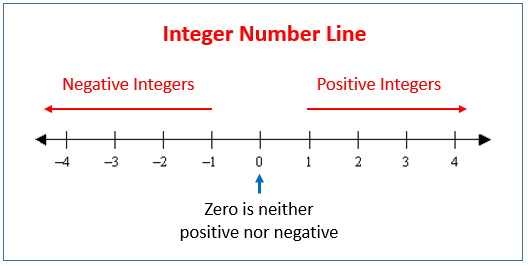 The following diagram show positive integers, zero and negative integers on the number line. Scroll down the page for examples and solutions. Integers consist of negative integers, zero and positive integers. 0 is an integer but is neither positive nor negative. Negative numbers have a ‘–’ sign before them. The opposite of a number is the number with the sign changed. Since 0 is neither positive nor negative, the opposite of 0 is also 0. Two numbers are opposites if, on a number line, they are the same distance from zero, but on different sides of zero. Integers can be represented on the number line. On a number line, the positive numbers are to the right of zero and the negative numbers are to the left of zero. An integer on the horizontal number line is greater than the number on its left and less than the number on its right. –1 is greater than –2 and less than 0. We can also write it as –1 > –2 and –1 < 0. Recall that “>” means greater than and “<” means less than. This means that all the integers on the number line are arranged in ascending order from left to right. On the number line, moving to the right is positive. On the number line, moving to the left is negative. Identify each number in the right column with its opposite in the left column. Identify which of the following numbers are integers, and then plot them on the number line. Number systems evolved from the natural "counting" numbers, to whole numbers (with the addition of zero), to integers (with the addition of negative numbers), and beyond. These number systems are easily understood using the number line.